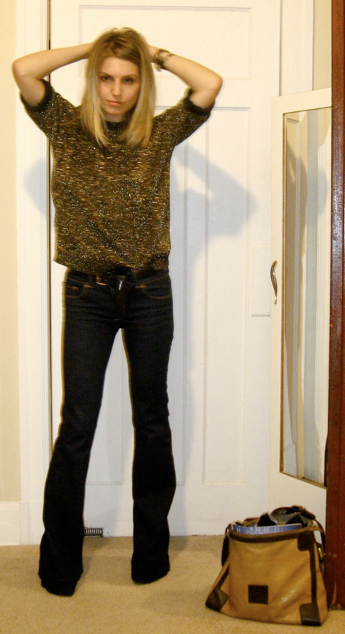 As the weather cools, i deem it time to bust out the disco-inspired attire. great jeans! love that shape on yoU! i love your shirt...so sparklyy! im pretty jealous that you can wear flared bottoms. i look extra large hefty and plump when i do. im running home now -thanks! that cut of jeans looks so good on you, and i love your bag! gorgeous look, really stylish- i love! that sweater is amazing, great outfit! i hear ya on the disco lady! LOVE YOUR TOP!!! What an awesome top - I love it!! But I say no to cooling weather...booo. OOO, Helene, did you get a new camera?? I love your sparkly top!! Have a good weekend. Omg, I love your jeans! I'm on the hunt for a great pair of black jeans right now. Have to check J Brand for sure!